Plot: Many years after the "Sixty Minute War," cities survive a now desolate Earth by moving around on giant wheels attacking and devouring smaller towns to replenish their resources. Starring: Hugo Weaving, Stephen Lang, Robert Sheehan, Frankie Adams. distributed by Universal «Mortal Engines» in the US movie theaters released on December 14, 2018 and has grossed over $82 million worldwide; dvd and blu-ray release date was set for March 12, 2019. Rent from Netflix and Redbox from March 12, 2019. 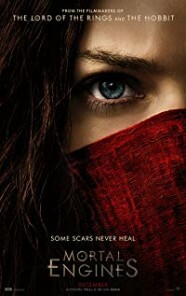 «Mortal Engines» in the UK released in movie theaters on December 14, 2018. The movie released on dvd and blu-ray on April 22, 2019.